I have gained feedback from my tutor regarding my original Critical Review and have now decided to go back over my tutor’s comments. While it was for the most part well received, there were of course some improvements that could be made. My tutor helpfully highlighted these for me and I would suggest the improvements I have been asked to consider making are pretty much all things I agree about in retrospect. I have decided to make this post to go along with the revised version of my critical review with the changes marked in red so it is possible to see exactly my thought processes while making the amendments. I started the original critical review with a question which I had changed as the critical review developed in the first place several times. The question ranged from: ‘Because it is our natural inclination to make aesthetically-pleasing photographs, when this is achieved does this then render the photograph’s meaning disparate from its aesthetics?’ To: ‘Because it is our natural inclination to make aesthetically-pleasing photographs, when this is carried out does this then detract from a photograph’s meaning?’ As well as: ‘It is our natural inclination to make aesthetically-pleasing photographs. When this is carried out does this then render a photograph’s meaning artificial?’ Finally I settled on: ‘Does the type of aesthetic approach employed by the photographer affect the accessibility of the work to an audience?’ I felt at the time this was a more concise question. However, my tutor has picked out a part to the question which I too fell could be construed in different ways. Namely: ‘affect the accessibility of the work’ which could potentially mean the logistics of getting the work to an audience. This wasn’t the intended meaning of the term accessibility which in my mind had meant ‘readability’. Therefore, similar to my tutor’s suggestion I changed the question to: ‘Does the type of aesthetic approach employed by the photographer affect the way a photograph is read by an audience?’. I started the answer to my question in the original critical review with a statement that aesthetics affect the reader of a photograph’s gaze and so the photographer is faced with whether to make the work ‘aesthetically-pleasing or gritty’ Just by using the term ‘gritty’ I was making an uninformed opinion that ‘gritty’ was the opposite of ‘aesthetically-pleasing’! My tutor duly pointed this out by remarking that ‘Gritty can be a kind of pleasing aesthetic though’. Although I agreed with my tutor, I did scratch my head wondering how best to implement my uninformed opinion about gritty and my tutor’s remark about gritty having the potential to be a kind of pleasing aesthetic too. The next line of my essay did introduce the subjectivity of aesthetics and my tutor’s report for my learning log signalled he liked the personal element of my review. Therefore I decided to use these facts to restructure the essay. I admitted my personal preferences for what was aesthetically-pleasing and not aesthetically-pleasing and then showed that this was a subjective opinion and that it varies among people what their aesthetic tastes are. A quick update from ‘aestheticising’ to ‘aestheticisation’ here. Moving on to the part of the critical review where I considered the impression Thomas Ruff’s Portraits 1986-1991 series made on me, my tutor and I’s opinions differed significantly. He found the superficial aesthetics of Ruff’s Portraits 1986-1991 pleasing, while I had said in my essay: ‘the superficial aesthetics were not particularly pleasing to the eye. I didn’t say the aesthetics were displeasing; however I also didn’t say why I didn’t find them particularly pleasing. My prompted reasoning for why I wasn’t particularly enamoured with the aesthetics was just that the lighting was quite flat and at first glance it seemed quite bland. Interestingly, this could be exactly the kind of reason Ruff succeeded in getting across the meaning of passport photo to me as a reader of the portraits. Looking at Ruff’s Portraits 1986-1991 again, they did grow on me as the lighting is quite soft in fact so I can see where my tutor is coming from. My tutor referenced an article when he observed I had written initially ‘blank expressions of people’ while describing Ruff’s Portraits 1986-1991. In my eyes he referenced this article for me in order to get me to think more deeply about why the expressions of the sitters were ‘blank’ and I would say I am satisfied with my final answer having read through the referenced article. The subsequent changes I made to the essay took into account the lighting (which showed everything of the sitter’s features) and in turn how showing this paradoxically helped to reveal nothing about the sitter’s feeling (as described by Ruff in the article), helped by their blank expressions. I then went on to suggest how this would affect the viewer’s experience of the portraits in relation to the size they were printed in the gallery I viewed them in (the Whitechapel gallery). I replaced ‘emotions’ with ‘opinions’ because I felt that while Moriyama may have had ‘emotions’ present concerning the ‘dark streets of Tokyo’ and its politics, he remained detached while photographing and therefore ‘opinions’ was a better description. Also I added the book Bye Bye Photography (1972) as a reference to how a consistent project aesthetically could influence a work and how it was linked to readability rather than emotion. I decided (with the help of my tutor’s comments) that the reasoning ‘this is because it does not conform to (a Western at least) standard taste for the beautiful which has been more popular’ was largely unfounded as Moriyama had been influenced by William Klein and also Robert Frank who were both Western photographers. I changed instead my reasoning to: ‘I would argue this is because it is necessary with Moriyama’s work (like Ruff’s Portraits 1986-1991) to look further beyond the superficial, which acts as just an (aesthetically-consistent) gateway to the meaning found within’ which was much more reasonable and tied in with the rest of my essay. A continuation of 7. with the removal of ‘emotion’ – this time being linked with beauty in my critical review. I used instead the term reflexive where Moriyama’s work was subjective but in a way that he looked at the medium he was working with. I added the new references for the relevant quotes as well as the page numbers for one of the references my tutor had picked up on me missing out in the original essay. Does the type of aesthetic approach employed by the photographer affect the accessibility of the work to an audience? Aesthetics are a key attribute of a photograph. They affect the reader’s gaze and so photographers are faced with the question of whether to make their photographs aesthetically-pleasing or gritty and true-to-life. What constitutes ‘aesthetically-pleasing’ or ‘gritty and true-to-life’ is a very subjective topic though, due to the fact that each viewer’s taste for pleasing aesthetics varies. ‘Judging beauty and other aesthetic qualities of photographs is a highly subjective task.’ – (Datta, Joshi, Li, Wang, 2006). Although this is a subjective task, by using a computational approach it has been possible to see ‘there exist certain visual properties which make photographs, in general, more aesthetically beautiful.’ – (Datta, Joshi, Li, Wang, 2006). Therefore although aesthetics are subjective, they do conform somewhat to a standard. It is our natural inclination to make aesthetically-pleasing photographs too: ‘Except for those situations in which the camera is used to document, or to mark social rites, what moves people to take photographs is finding something beautiful.’ – (Sontag, 1977). The intended usage of the photograph is one factor to take into account because it can dictate whether a photograph is used to document or to find something beautiful. Certain photographers combine these two disciplines (documenting and finding something beautiful) to express powerfully their vision and one such photographer is Sebastião Salgado. ‘In their strong formal design, Salgado’s pictures revive photographic modernism with its emphasis on geometry and visual contrast. Beauty is pressed into the service of an old-fashioned humanism…’ – (Stallabrass, 1997). This description of his photographic approach shows Salgado’s strong aesthetics but also hints at his moral code when taking these photographs. Although he has been very successful in his projects, he has also been criticised by some for the beauty inherent in even his most haunting photojournalistic photographs. One prominent critic of Salgado’s ‘aestheticisation’ of suffering was Ingrid Sischy. She argued that ‘this beautification of tragedy results in pictures that ultimately reinforce our passivity toward the experience they reveal.’ – (Sischy, 1991). By combining documenting something factual with the aestheticising of these facts, Salgado is in fact detracting from the photographs’ message in terms of their power to portray the truth of what they depict. I would agree on a base level that the viewer of such photographs (Salgado’s beautiful documents) is more likely to be distracted from the message because of the aesthetics than had the photographs simply aimed to portray ‘the truth’. For example with Fig. 1, (Mraz, 2002) makes the point that: ‘The photo’s psychological tone is set by the solemn expressions on the children’s faces and their prostration on the floor’. In my eyes though the ethereal lighting from solely the open doorway with the strong tones of light and dark created from this (especially on the bones themselves) capture and divert my attention for far longer. However, I would also then suggest the critic of such an argument – that Salgado’s aesthetics distract from the message – is missing a vital point. Salgado’s projects clearly reach a great audience and in this regard at least he has been successful. If his works’ aesthetics were not so powerful and beautiful would his work have reached so massive an audience? Therefore perhaps Salgado is looking at the wider picture in so far as getting a message across, even if it means aestheticising the facts. So far I have only been concerned with superficial aesthetics of photography as this is the foremost feature people get to when looking at photographs. Photographs can also be regarded as beautiful beneath their outward appearance and I would assert that this gives such photographs more liability to possess deeper meaning once the message has been uncovered. A photographer I have recently been to an exhibition of: Thomas Ruff springs to mind as an example where the work is not immediately beautiful (at least to my eye) but instead the viewer has to read into the work to find beautiful meanings within the work. One of his most famous projects: Portraits 1986-1991 (see Fig. 2) employs several strategies to enable the viewer to find meaning within the work which I myself found beautiful. Showing Fig. 2 in this size on my blog felt like I was doing a disservice to the impact the enormous print has on the viewer when looking at it in a gallery. On the other hand the superficial aesthetics were not particularly pleasing to the eye; the photographs depicting the blank expressions of people Ruff knew from those years. However, this is part of the ruse where Ruff produces these massive prints of vacant faces, enticing the viewer to wonder why they are printed so monumentally big when they are just like passport pictures. Unearthing the message beneath – for me it was that the passport style pictures allow the viewer their own interpretation of the sitter which is ultimately a contrived one – was a rewarding experience. Although I picked up on this meaning somewhat by myself I still had to back up my assertions from another source – ‘a portrait by Ruff looks like a very large passport photograph. … Any personality a sitter may have is there because you, the viewer, have projected your own feelings and prejudices on to the image.’ – (Dorment, 2003). In my opinion this gaining of understanding, while rewarding, is also less immediate and has less widespread ‘appeal’ than the superficially beautiful work of, for example Salgado. Because the reader has to search for the beauty embedded inside rather than on the surface, more casual readers may not bother gaining understanding from work like Ruff’s, where the aesthetics are imbued within. Looking at this from an aesthetic point of view it would be possible to argue that both draw from the vernacular: Ruff playing upon it intentionally by taking all the ‘accidental’ elements out of the traditional vernacular and using them to his advantage like with his Portraits 1986-1991 project (see Fig. 2). 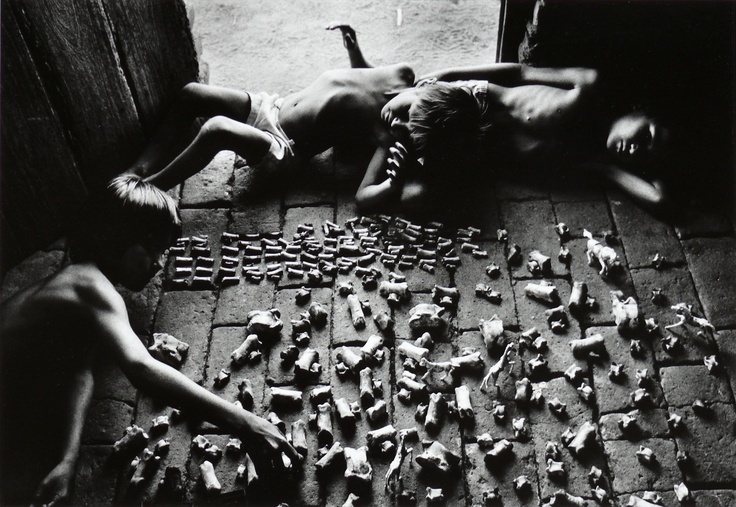 On the other hand, Salgado employs telling juxtapositions (like the children juxtaposed with the bones in Fig. 1) and combines this with selective framing and often dramatic, otherworldly lighting. All of this becomes unified because Salgado continues to utilise the black and white medium. Although this might seem like the opposite of traditional vernacular imagery – where colourful, seemingly accidental snapshots are prevalent, looking closer it seems Salgado has culminated the ingredients of the vernacular into a more sophisticated version. Moriyama at the time he was taking photos on the streets of Tokyo (in the 1960s) prescribed like the group of left-wing photographers he joined to a style developed to break away from aesthetic conventions of a ‘good’ photograph found in European and American photography. They instead employed an aesthetic that ‘was identified with the expression ‘are, bure, boke’ – grainy, blurry and out of focus, in reference to the three main characteristics that distinguished the group’s images’ – (Scaldaferri , 2017). Moriyama’s reasoning for using such gritty aesthetics (see Fig. 4) was that he was ‘Refusing the idea that the photographic medium could only be used to produce archival documents,’ instead ‘putting an accent on its image-making capability’ – (Scaldaferri , 2017). He thereby used the aesthetics of as a conduit to express his emotions about the state of Tokyo’s dark streets at that time. Moriyama was and remains very popular, influencing other photographers and young people especially in Japan: ‘The older generation appreciates a lot of Daido’s work, but right now he is very, very popular among young people’ – (Uematsu, 2012). However, the appeal of his work is not as widespread (outside of Japan) as say Salgado and I would argue this is because it does not conform to (a Western at least) standard taste for the beautiful which has been more popular. An important note this brings up is the subjectivity of aesthetics because the emotion Moriyama’s work evokes clearly affects certain viewers more than others. What I could see influencing me from Moriyama’s work would be the understanding that the process of making an image can be far more important in terms of emotion conveyed in this process than the aesthetic. Having said this, Moriyama clearly intends to go consistently for the ‘are, bure, boke’ look. For me this deliberation could be because his work transcends the traditional vernacular with the choice of black and white medium and emotion caught in the frames. While it may be true that photographs with gritty superficial aesthetics are not as accessible as work which conforms to our standard taste for the beautiful, often there is a space for deeper meaning to be accessed by the viewer in the work. This could be whether it is intended by the photographer – by playing upon the vernacular – or not. As long as the work is consistent too the viewer may gain more from a set of photographs than a singular, glorified image. Also it may well be important to the photographer to display emotion in their photographs which in itself could be considered beautiful. In a funny kind of way photographic projects with aesthetics that don’t conform to a standard taste for the beautiful have more art value than work which doesn’t play on the vernacular or is less emotional. All of this depends on what kind of impact the photographer wishes to make and to what type of audience. Sischy, I. (1991). ‘Good Intentions’. In The New Yorker (9th Sep. 1991) [Online] Available at: https://paulturounetblog.files.wordpress.com/2008/03/good-intentions-by-ingrid-sischy.pdf [Accessed on 23 Nov. 2017].